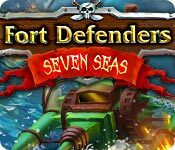 Fort Defenders: Seven Seas is rated 3.9 out of 5 by 7. Rated 5 out of 5 by anamneses27 from Hours of Addictive Fun! I wish they had a part 2 and at least 3 more boards for part 1! This game has awesome graphics, is challenging and a great way to lose 4 hours! Rated 5 out of 5 by pennmom36 from Fort Defenders Beefed Up! Don't sail the Seven Seas toward my castle, I'm well defended! I have bought just about every one of these Tower Defense games and I was really surprised by this version which is really beefed up. The levels progress much quicker and the enemies bring on their A game after just a couple of levels. I hate those evil fish that put all my weapons to sleep just as much as those sly little ships that go undetected by going under the water and then pop up at your castle gate! You earn gold with mines as well as for each enemy you destroy which is how you buy and upgrade weapons. You also earn barrels that can be used to buy upgrades such as bigger ranges, more damage or cheaper to purchase, and you can use the barrels to place weapons on areas that only allow you to place a weapon with barrels. (usually the prime spots) Each level gives you 25 lives and there are usually 4-6 waves of attack so strategy is a must, however, you can restart the level as often as you would like to try different strategies. The starting point that the enemy takes is always marked and if you have the wave start before the timer you receive more points. Great TD game, enjoy! Rated 5 out of 5 by TinyBob from Great I've played this for a few hours straight now and I still love it. It is a towers game. It is challenging and difficult to get three stars for a level, but you can usually get past most after a try or two. There are plenty of levels, I haven't finished it yet. I like the visuals of different kinds of water craft. There isn't anything I don't like really. Glad I bought it. Rated 5 out of 5 by Village_people from To arms in second time! Now the battle rages on by land and by sea! 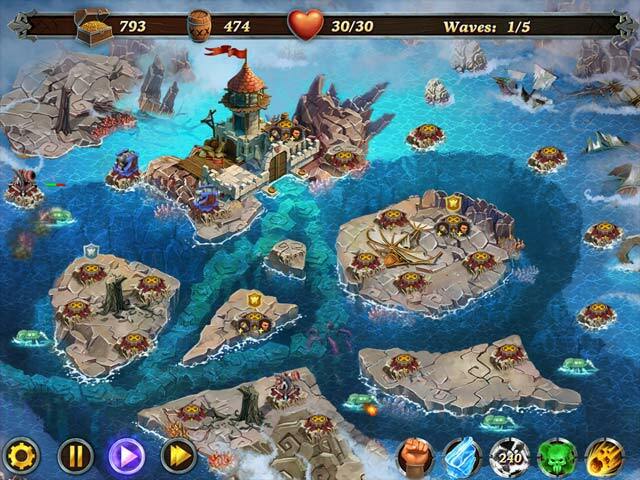 This game supposed to be second part of Fort Defense with new maps and units unlocked. 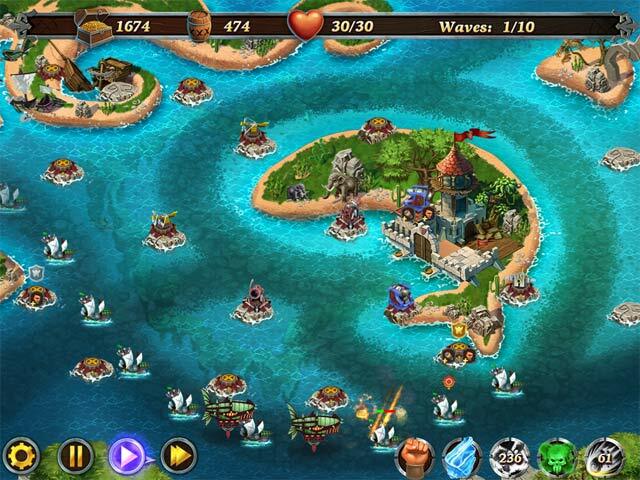 So its nice pirate style strategy tower defense game. 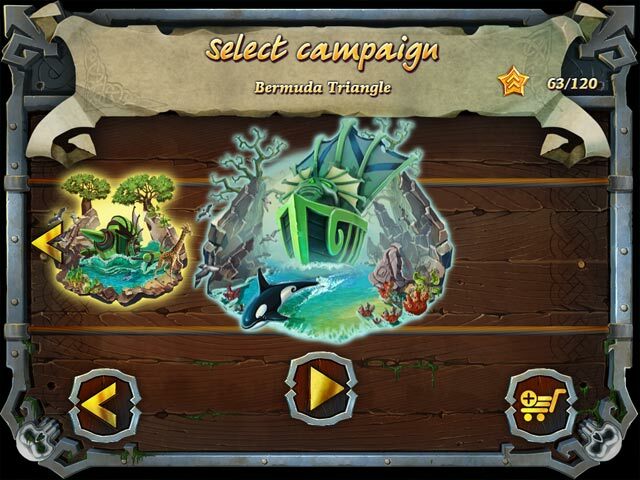 as it says four worlds, 80 levels, unique ships, menacing bosses and powerful spells - all this will deepen you into the game. Rated 4 out of 5 by tesamoine from Ahoy A nice tower defense game involving pirates. 3 levels of play to choose from. I chose Easy since I am not very good at these games. You get quite a choice of weaponry to fight off the thieving pirates. I got through the demo fine but it was getting very difficult toward the end of the demo. There are many levels so I feel this will become a very challenging game. Rated 2 out of 5 by SharkiB from Same old.... same old. I loved the first 8th Floor game Royal Defense - and bought all three in the series. I bought their first Fort Defense as well and bought that too. But they're phoning this one in. Same graphics - same ships, same fort same music same guns just different paths? Really? And when within the free trial I got to a map that had four spots that needed to be "bought" with barrels I knew the ridiculous grind for spots & perks would be the same as well. I've played this game before. FOUR TIMES. I want something different. I will not be buying this game. Rated 1 out of 5 by games4jane from Frustrating and Hard! I usually love Fort Defense style games. This one is just too hard to win! So frustrating to not be able to figure out how to get three stars on the higher levels in the first section. The second section was not even playable!